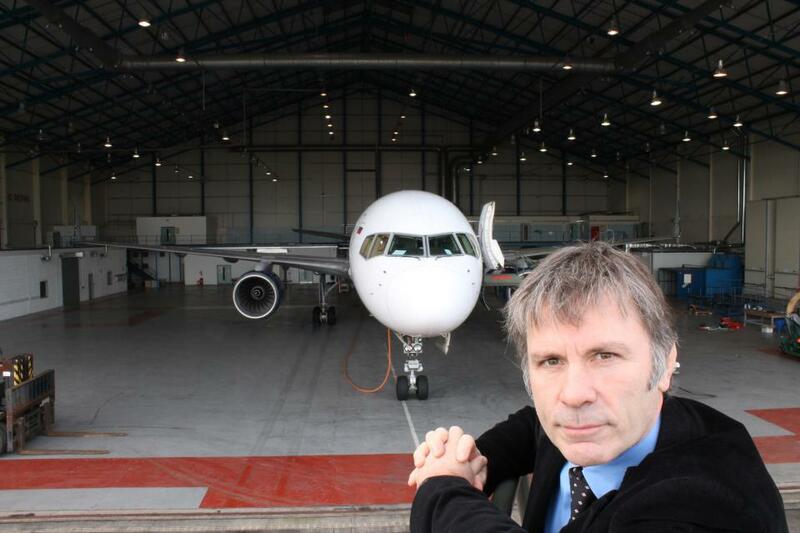 Iron Maiden singer Bruce Dickinson’s aircraft maintenance business, Cardiff Aviation, has secured a £5 million (approximately $7.68 million) investment that will help the new company develop across the South Wales aerospace industry. Wales Online reports about one third of the funds will be contributed by Finance Wales, the U.K. SME investment company and Welsh Government subsidiary, with the remainder coming from private or privately-owned investors, including Dickinson and his business partner Mario Fulgoni. "The Welsh Government has played a fantastic role in a difficult economic environment in providing tremendous support and enthusiasm,” says Dickinson. "Finance Wales' long-term backing is the fuel not just to put St Athan on the map, but has the potential to create a consequentially much wider impact across the entire South Wales aerospace industry." "As for Cardiff Aviation, the first key role we plan to fill is that of commercial director," he continued. “We will follow up with expansion of the operational and technical teams to address our current growth trend and increasingly lucrative contracts with both U.K. and international aviation businesses. We also plan to invest in more engineering equipment to supplement and enhance the already excellent technical capability at Cardiff Aviation." In the spring of 2012, Dickinson launched Cardiff Aviation as a major commercial airline maintenance repair and overhaul operation in South Wales. The company is based at the Twin Peaks hangar at St. Athan in the Vale of Glamorgan. The company specializes in heavy maintenance of Airbus and Boeing commercial aircraft, and can address virtually any planned or unscheduled engineering or maintenance challenge, project or issue. The cash injection will now see Cardiff Aviation target the $2 billion European MRO market, which is currently growing at around three per cent a year as commercial airlines look to outsource fleet maintenance. Dickinson and Iron Maiden are currently playing shows across Europe on their Maiden England world tour; they headlined the UK’s Download Festival on Saturday.